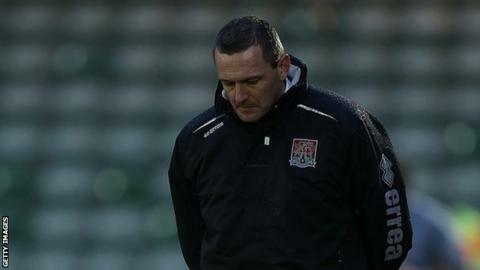 Aidy Boothroyd was sacked as manager of struggling Northampton Town shortly after their home drubbing by Wycombe. The visitors needed just 13 seconds to take the lead, Joe Kuffour converting Nick Arnold's cross, before Dean Morgan set up Kortney Hause to make it 2-0. Izale McLeod netted from close range to reduce the deficit but Wycombe captain Stuart Lewis restored the two-goal lead with a shot through a crowded area. Morgan completed the scoring, racing clear to beat Matt Duke late on. Confirmation of came less than an hour after the final whistle at Sixfields. "This is a huge win for us. It's been coming and I've told people it's been coming and to beat a team like that 4-1 away from home is really special. "I got quite emotional at the end because I've been wanting that for so long. Losing so many players, we were on our last legs today, but they've come and under adversity have given me everything and I'm so proud. "Jo Kuffour has been waiting patiently, getting on with his training and waiting for his chance. He's proven to me that he wanted and deserved his chance - and he took it after 10 seconds. "Statistics are amazing. Yesterday I was six without a win, and now I'm three unbeaten. But it's a real boost to go into the Christmas period." Match ends, Northampton Town 1, Wycombe Wanderers 4. Second Half ends, Northampton Town 1, Wycombe Wanderers 4. Joe Widdowson (Northampton Town) wins a free kick on the right wing. Substitution, Wycombe Wanderers. Matt McClure replaces Jo Kuffour. Attempt saved. Roy O'Donovan (Northampton Town) header from the centre of the box is saved in the centre of the goal. Roy O'Donovan (Northampton Town) wins a free kick in the attacking half. Foul by Nick Arnold (Wycombe Wanderers). Dean Morgan (Wycombe Wanderers) wins a free kick in the defensive half. Attempt missed. Chris Hackett (Northampton Town) right footed shot from the right side of the box is close, but misses to the left. Stuart Dallas (Northampton Town) wins a free kick on the right wing. Goal! Northampton Town 1, Wycombe Wanderers 4. Dean Morgan (Wycombe Wanderers) right footed shot from the centre of the box to the bottom right corner. Foul by Izale McLeod (Northampton Town). Kortney Hause (Wycombe Wanderers) wins a free kick in the attacking half. Attempt blocked. Kortney Hause (Wycombe Wanderers) header from the left side of the six yard box is blocked. Corner, Wycombe Wanderers. Conceded by Matt Duke. Attempt saved. Nick Arnold (Wycombe Wanderers) right footed shot from the centre of the box is saved in the top right corner. Goal! Northampton Town 1, Wycombe Wanderers 3. Stuart Lewis (Wycombe Wanderers) right footed shot from the centre of the box to the bottom left corner. Assisted by Nick Arnold. Foul by Roy O'Donovan (Northampton Town). Attempt missed. Ishmel Demontagnac (Northampton Town) right footed shot from outside the box is high and wide to the left from a direct free kick. Luke Norris (Northampton Town) wins a free kick in the defensive half. Hand ball by Richard Ravenhill (Northampton Town). Substitution, Wycombe Wanderers. Billy Knott replaces Max Kretzschmar. Kevin Amankwaah (Northampton Town) wins a free kick on the left wing. Matthias Kouo-Doumbe went off injured after Northampton Town had used all subs. Corner, Northampton Town. Conceded by Max Kretzschmar. Anthony Stewart (Wycombe Wanderers) is shown the yellow card. Izale McLeod (Northampton Town) wins a free kick in the defensive half.